24 March 2015Shuffle Rewind - nearly here! 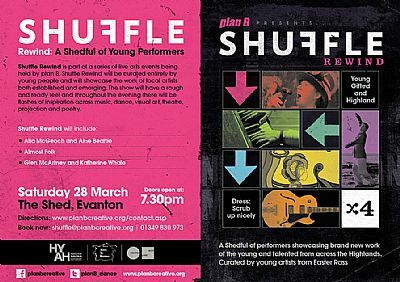 Shuffle Rewind is nearly upon us so it’s time to book for another original live, arts event at The Shed. Shuffle Rewind will be curated entirely by young people and will showcase the work of local artists both established and emerging. The show will have a rough and ready feel and throughout the evening there will be flashes of inspiration across music, dance, visual art, theatre, projection and poetry.